Maddie Fraley, Lisa Rodenfels, and Alex Fraley at the Ohio Stark Co. Fair, September 2010. The Fraley girls of Running Briar Farm did well at the Ohio Stark County fair in September. 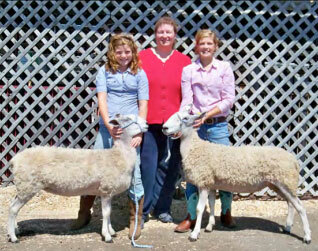 They entered Bluefaced Leicesters in both the youth 4-H and open classes. Shown in the photo are Maddie (left with Babydoll), BLU president Lisa Rodenfels (center), and Alex (right with Vogue) with their 2nd and 3rd place open AOB yearling ewes. They went on to win 1st place pair of ewes in the AOB class.